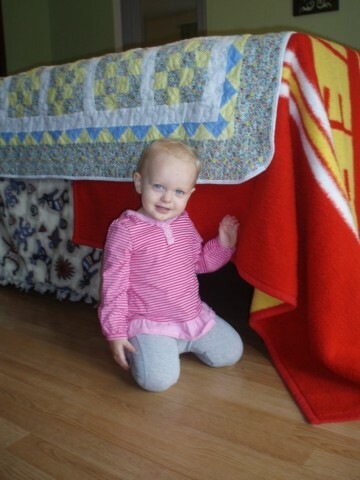 crafty things | we got us a family here! Valentine’s Day has turned into Valentine’s month around here…well, the first 14 days of this month. I saw this idea on Pinterest and really wanted to do it. Then I found these mailboxes in the dollar bin at Target and voila! 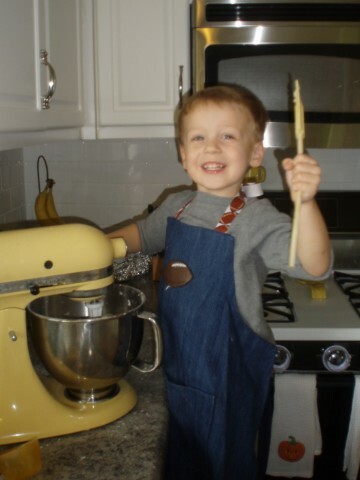 More dollar store fun…Dollar Tree has basic white plates for $1. Awesome! I figured even if I completely screwed up a Valentine’s Day plate, I’d only be out a buck. I tried to do a handprint plate with the kids hands making a heart shape. Pinterest idea…and it bombed. 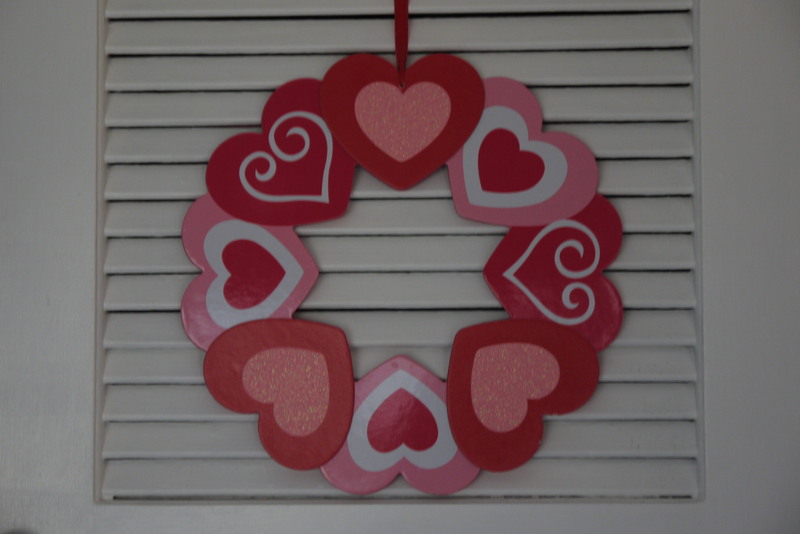 Then I thought that maybe I could make hearts out of thumbprints…and it worked. 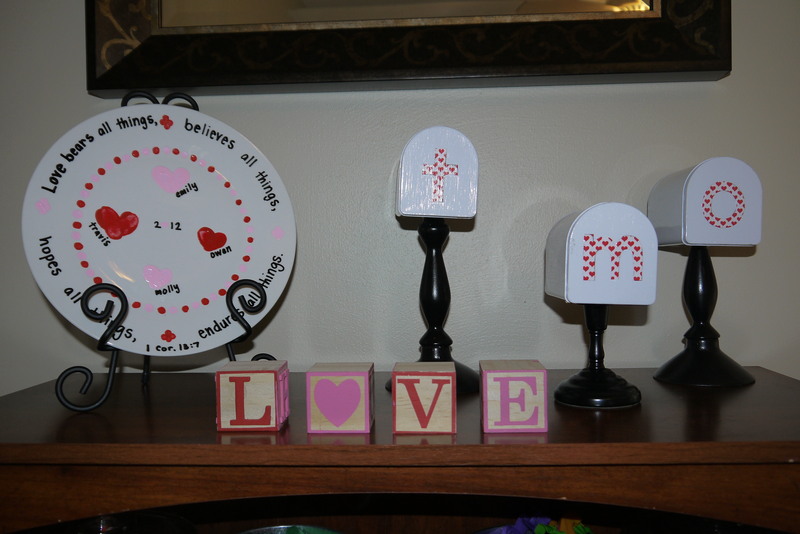 Each family member contributed a thumbprint heart, and the plate was done! I’ve loved doing this with my kids over the last 14 days. They get so excited to come to breakfast and see if the red flag is up on their mailboxes. And then they love listening to me read what their note says. 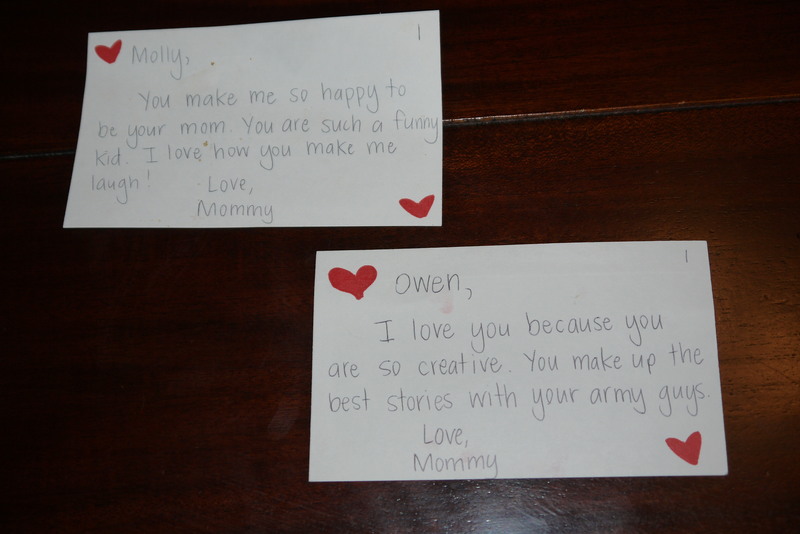 Molly would end each note with a little giggle and a big hug, while Owen would often make suggestions about what he’d like his next note to say. For example, one day I wrote how much I love to hear him sing. He wasn’t a big fan of this note and requested that the next day I comment about how much he loves Batman and Joker. Goofball…I don’t think he totally got the point. Anyway, Valentine’s month has been great. I don’t know if it’s made as much of an impact on the kids as it has with me. Focusing on the wonderful things about my kids that make them special has helped me focus on the positive things when they’re screaming at each other and fighting over the same toy! Thanks to Pinterest, my Christmas budget was a bit more frugal this year. Because I think it’s fun to see what other people create, I’m going to share what I’ve created with you! If you have no interest, just skip this post. But some of you crafty types like this kind of post, right? 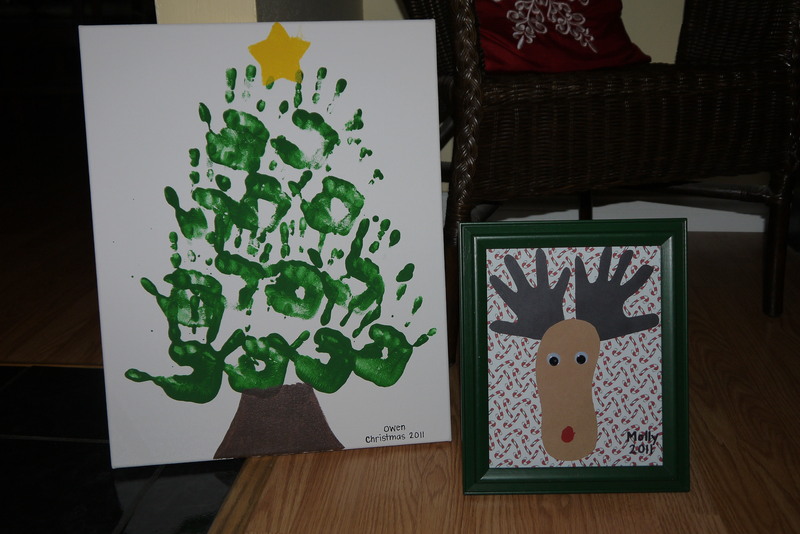 First, Owen made a handprint Christmas tree on a 16×20 canvas for Mimi and Dada. And Molly made a footprint/handprint reindeer for them with a red thumbprint nose. 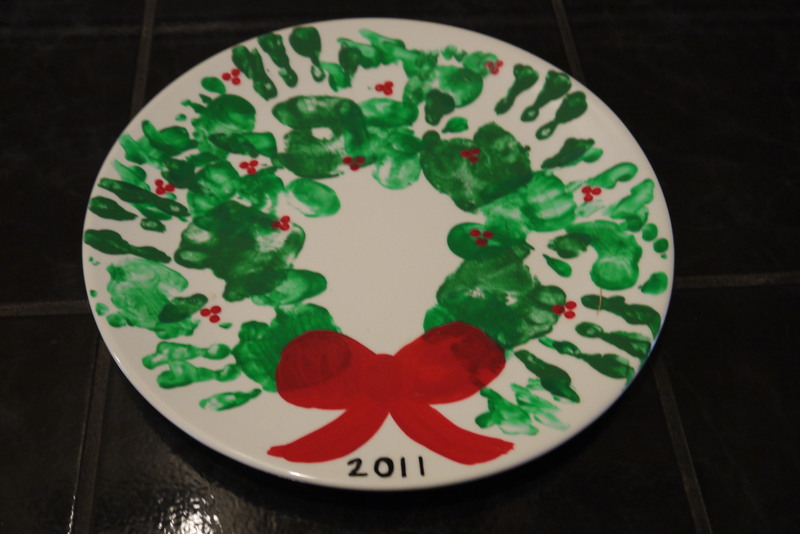 Next, the kids and I made a handprint/footprint wreath platter for Nana and Bubba. 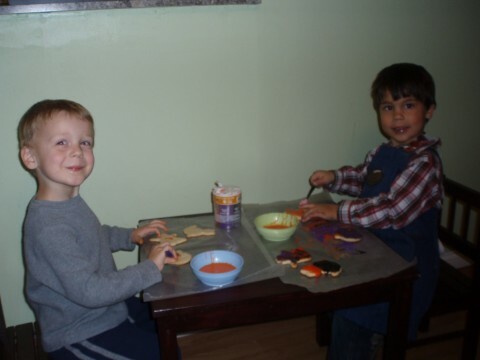 Owen’s handprints were in dark green and Molly’s handprints and footprints were in lighter green. Then I drew the bow and q-tipped the holly berries…and voila! I had a hard time giving this one up…I may need to make one for myself. Last, Abbey and I got together and made presents for friends and teachers. My mom and mother-in-law were also the recipients of these presents. 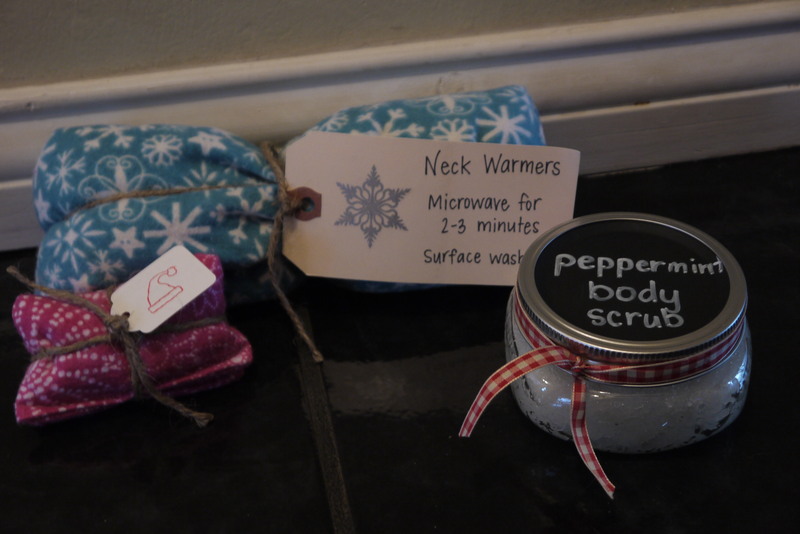 We made neckwarmers and handwarmers out of flannel material stuffed with rice that we scented with peppermint essential oil. And we also made sugar body scrubs for the shower. These were SO easy and I love the way they make your skin feel in the shower! We made peppermint body scrub, lavender body scrub, and brown sugar spice body scrub. These gifts were so easy, fun to make, and budget-friendly. There you go…crafty Christmas 2011. Pinterest! Not what you expected me to say, right? But it’s true. I can’t get enough. I am rarely on Facebook anymore, haven’t checked the blogs on my blogroll in at least a week (no offense to my fellow blogger friends), and have been delinquent in responding to emails. All because of my new obsession. 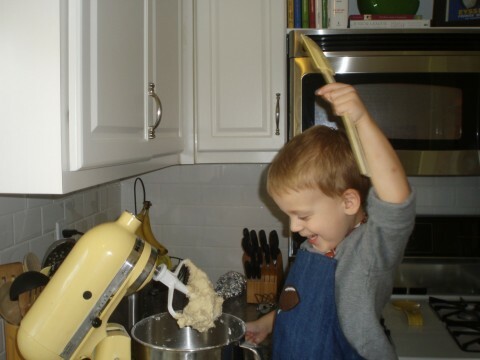 If you haven’t joined Pinterest yet…DO IT! You won’t regret it. If you have no idea what this Pinterest thing is, here’s a quick explanation. Basically it’s website you can join (similar to Facebook) where people share pictures of things they like in different categories (crafts, kid stuff, recipes, home decor, travel, music, movies, books, etc…). I thought it sounded lame when I first heard about it. I honestly thought it would be another time waster that I didn’t need. But then one night while Travis was out of town I decided to see what all the fuss was about. After three hours online I had to MAKE myself stop…and I was hooked. My one worry was that I wouldn’t actually create anything that I saw…but I’ve already made a few things that I’ve seen on Pinterest and I have a long list of projects waiting in the wings. Here are some of the things I’ve made…. 1. 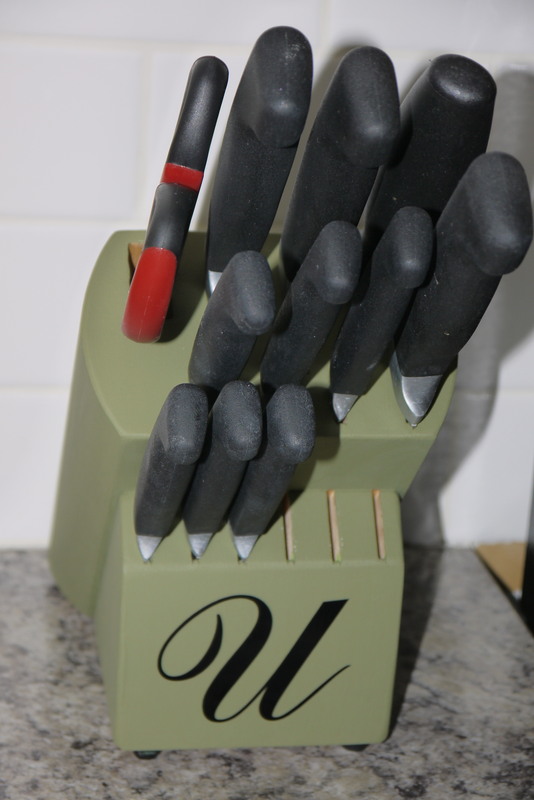 My new knife block. My first project. 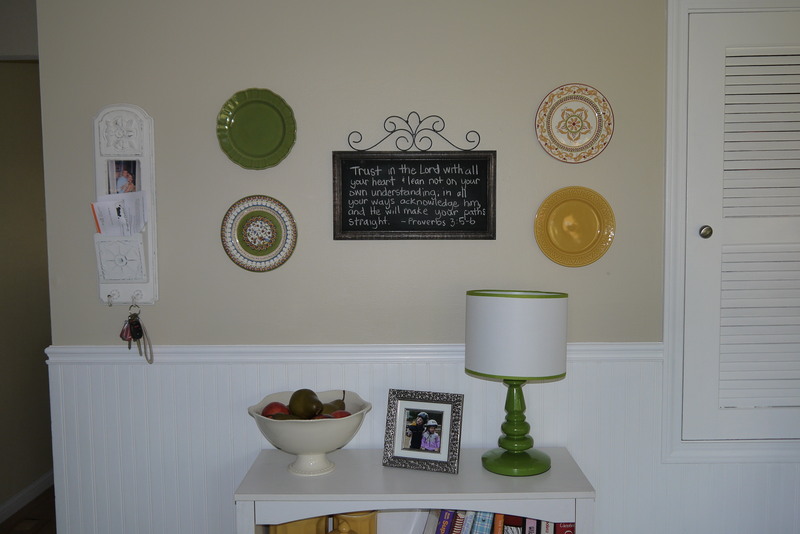 It used to be boring a boring butcher block, but add a fun paint color and a last name initial…Voila! 2. 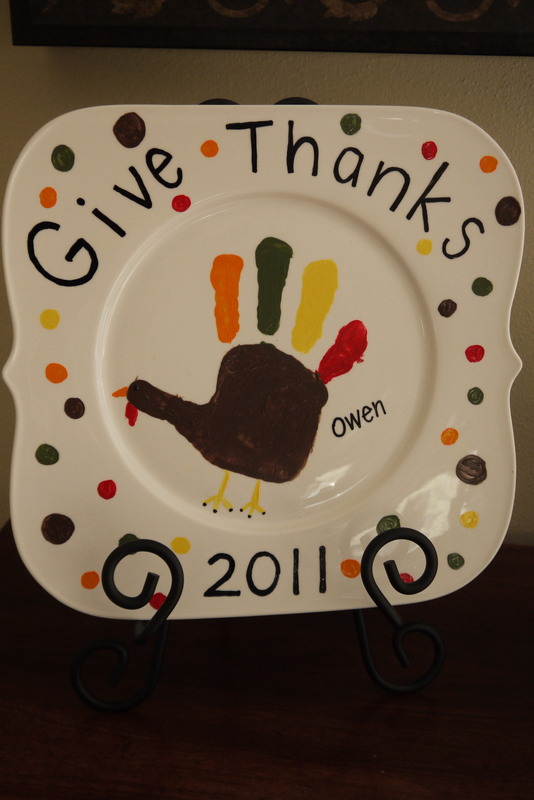 My second project…Thanksgiving handprint plate. A cheap plate, some enamel gloss paint from Hobby Lobby, and my son’s hand made this one happen. 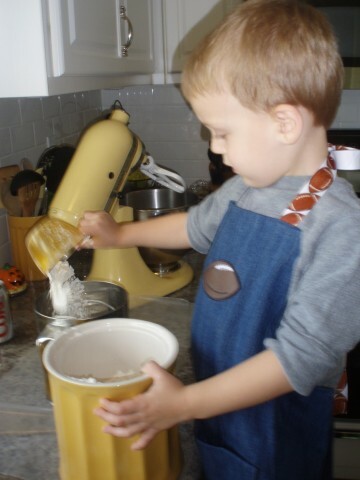 It’s not food safe, but I’ll just display it every year at Thanksgiving and remember how sweet and little Owen’s hand used to be. 3. My newest project and the one I’m most excited about…pajama pants! I got a sewing machine for Christmas last year but never had time to learn how to use it. Now that Travis is traveling so often, I’m having time to figure it out. 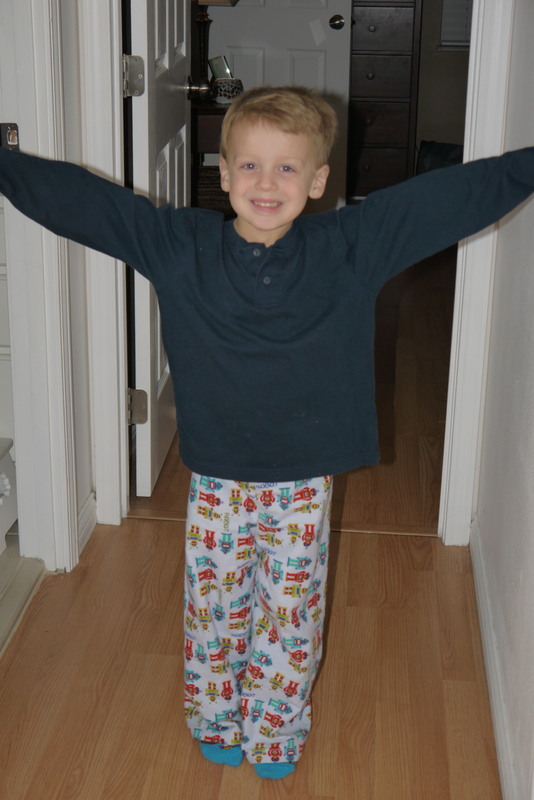 Jo-Ann’s had flannel on sale for $3 a yard last week and I bought three different materials to make him some new jammies…and it was about time. 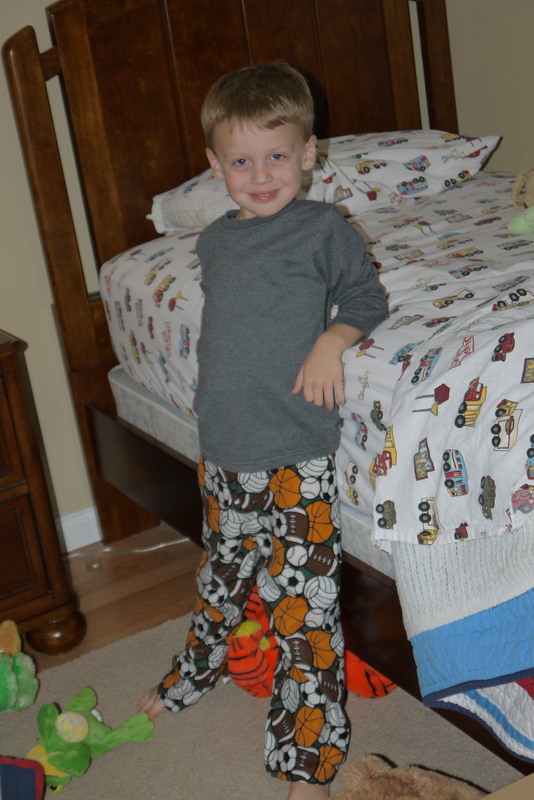 His had become capri pants…not cool for a four- year-old boy. 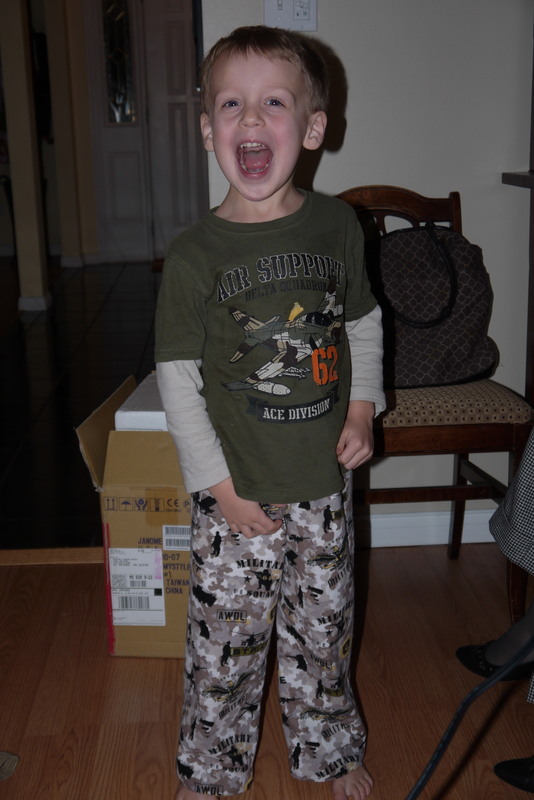 Here’s my first pair…army guy pants. 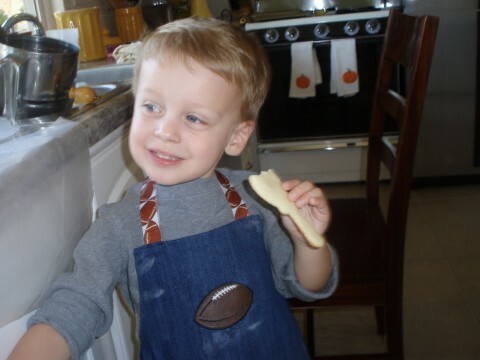 I wasn’t crazy about the fabric but knew Owen would love it and I was right. He wore them for 24 hours straight when I finished them. My second pair…robots. And a $2 shirt from Goodwill. Cheap jams. And the third pair…sports theme with a $3 Walmart shirt. I also made teacher gifts for the kids’ teachers, but I won’t share that quite yet because some of my most loyal readers just might be getting the same thing for Christmas. So if you haven’t already…go check out Pinterest. It will change your life forever. Seriously. 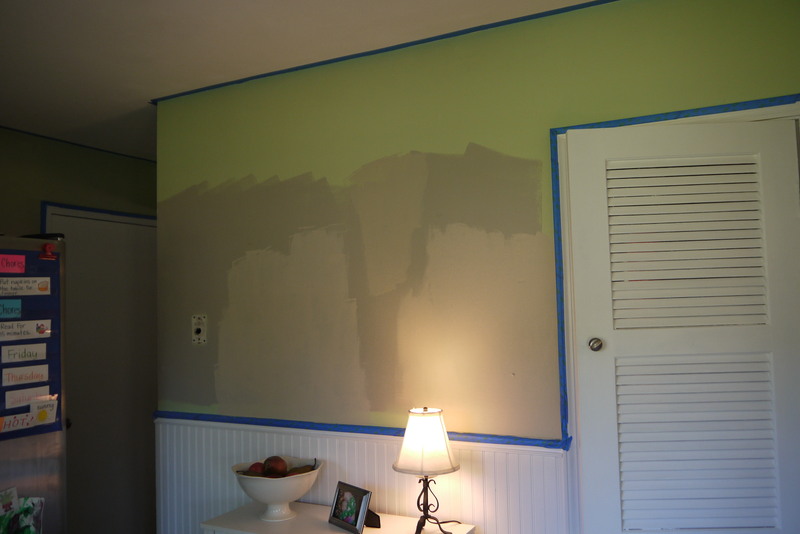 After looking at the colors in all different lights, I chose Urban Putty from Sherwin Williams. After getting it on the walls and redecorating a bit, I love it! I love having more color in the room through accessories. 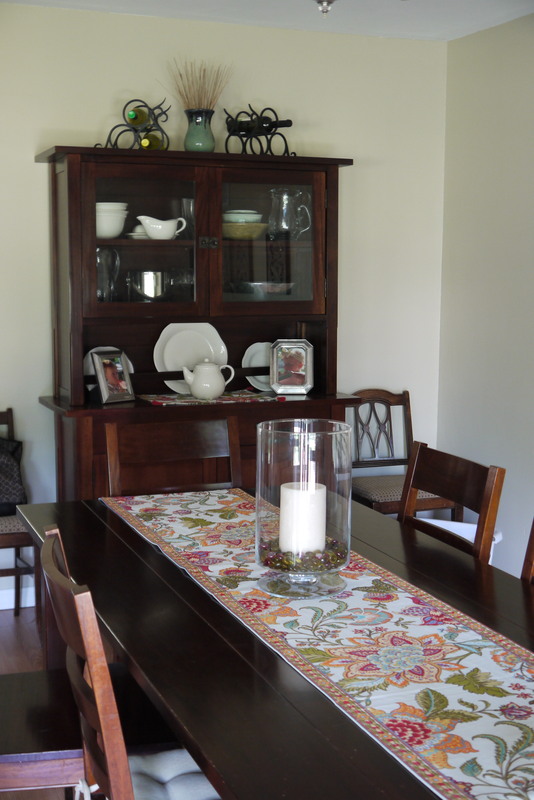 I found this fun table runner at World Market and love the colors it introduces in the room. I discovered through this decorating adventure that hanging plates is NOT easy. All those plate hanging hooks that you can buy are tricky! I couldn’t get them to work with my plates. I ended up buying some super strong glue and sawtooth hangers and gluing them on the backs of the plates. I haven’t heard any shattering glass in the middle of the night…so far so good. I also thought this was a fun idea that my friend, Abbey, gave me. I found a fun piece of scrapbook paper, framed it, and then used a dry erase marker to write a verse on it. It only cost me 50 cents for the paper so I can change it out with the season…or whenever I get tired of it. 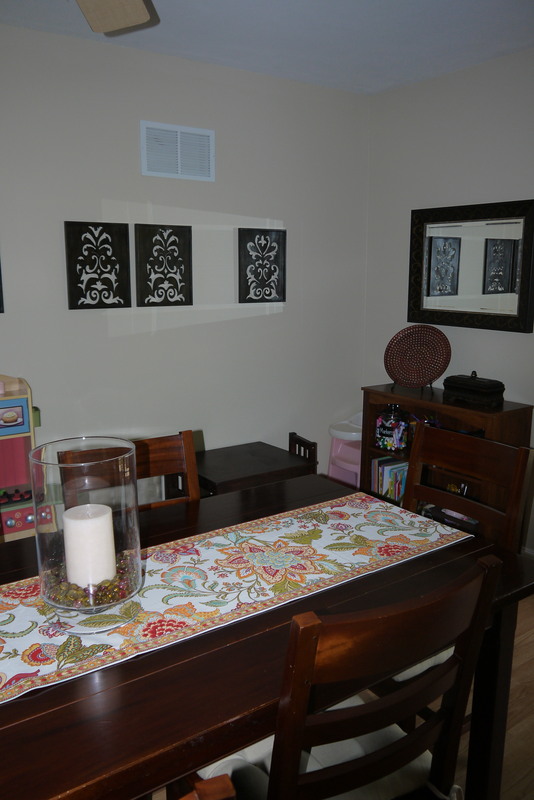 Moving on to the part that I love the most…the kids now have an art corner! Our house is small without a whole lot of storage space (upstairs). All the kids’ art supplies used to be stored in the top of Owen’s closet. Not very convenient. And, to be completely honest, I often didn’t suggest doing art activities with the kids because it was such a pain to get everything down. 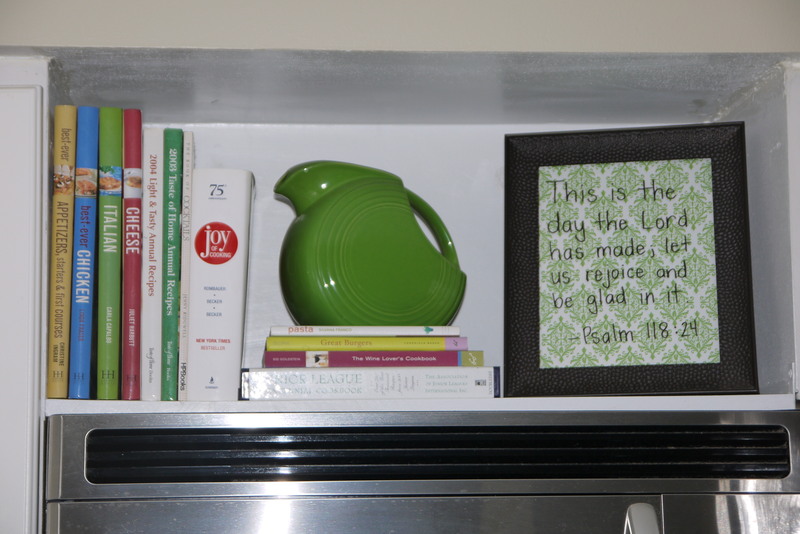 I have this shelf in my dining room that has always been home to decorative cake plates and the like. I had a vision of turning that into an accessible art corner for the kids…and now the dream is a reality! 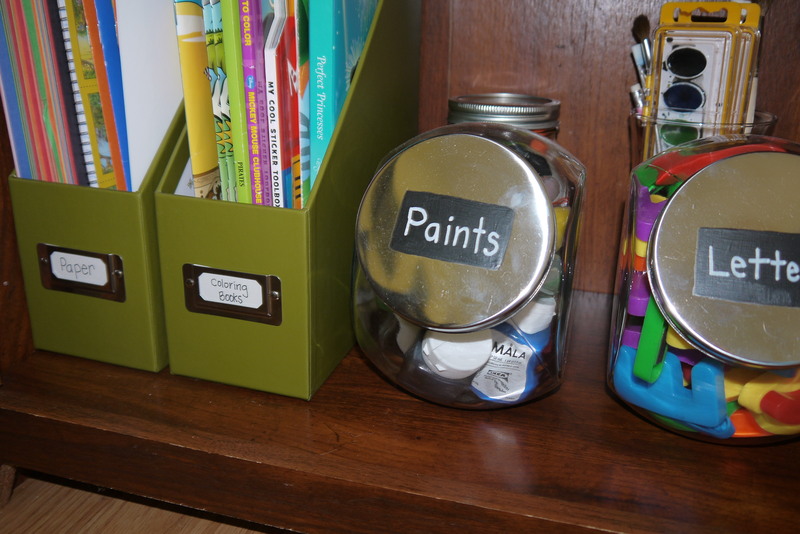 I love the see through containers so the kids can choose what they want to play with without having to be able to read. 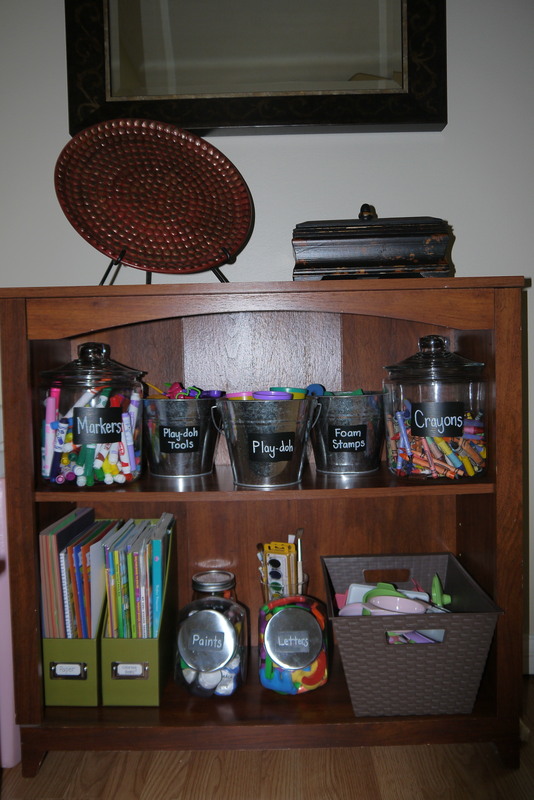 A little chalkboard paint and a white paint pen made my little organized-obsessed self very happy. Everything has a label. Bliss. I can’t even begin to tell you how much I love this. 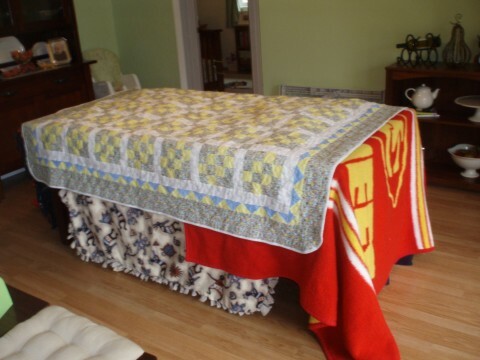 Ever since I put this together, the kids are obsessed with doing projects. They can easily find their own supplies and get started without as much reliance on me. The little table is now right next to the art shelf so they can get right to work. It’s working out so great. I wish I’d done it years ago! Lately it seems rare when we have nothing on the calendar. 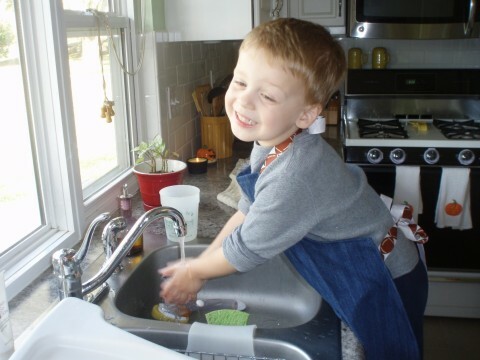 There were an abundance of these days, it seemed, during the summer when we longed for routines to kick back into gear. Now I relish the days we can wake up, stay in jammies most of the morning, and never leave the house. Today was one of those days. The kids thought they’d died and gone to heaven. We played with the Thanksgiving pilgrims and Indians, read books by flashlight, and worked really hard on remembering not to stand up inside the fort. Several bumped heads and tears later, this lesson was learned. 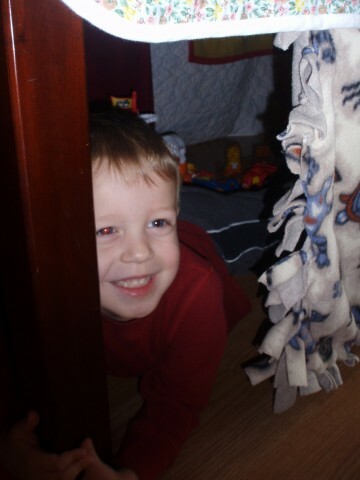 Owen played in the fort for 2 hours this morning. Molly thought it was awesome but really delighted in knocking over all the army guys that Owen had so carefully set up. I long for the day when she’ll just leave his stuff alone. Will that ever happen?? This was one of those lazy mornings that I wish we could have more often. I got the chance to play with the kids and I didn’t once worry about all the other things I should be doing around the house. The laundry can wait. The dust will still be there tomorrow. It was just what we needed. …And then I realized I’d gotten too distracted while playing with Owen and Molly was way too quiet. What was she doing?? Eating dirt out of one of my plants. Awesome. 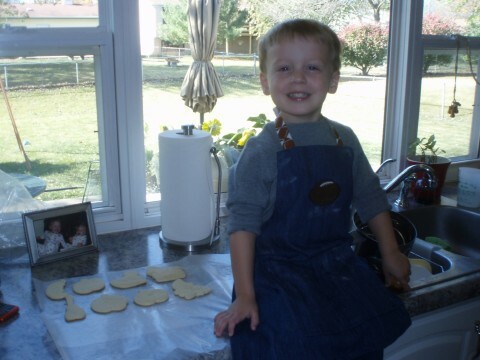 A few days before Halloween, Owen helped me make sugar cookie cut-outs. We made sure Molly was fast asleep (because that’s the ONLY way anything gets done around here), put on our aprons, and got to work. Step 1: Wash those hands! Step 2: Measure the dry ingredients. 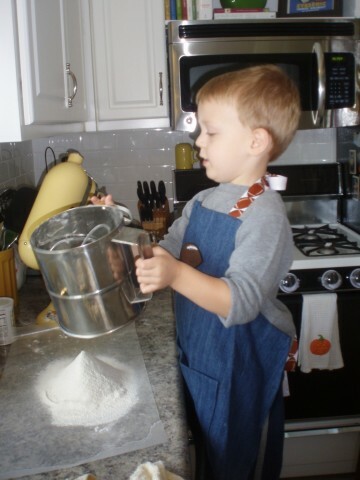 Step 3: Sift, sift, sift! Step 4: Mix, stir, and blend with the spatula. (Funny story, Owen kept saying, “Mommy, can I use the bachelor?”. 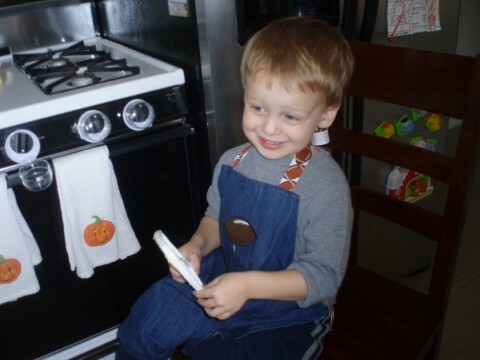 I told him that it was actually called a spatula and he said, “That’s what I said. The bachelor!”. I guess you all now know what TV show is my guilty pleasure. 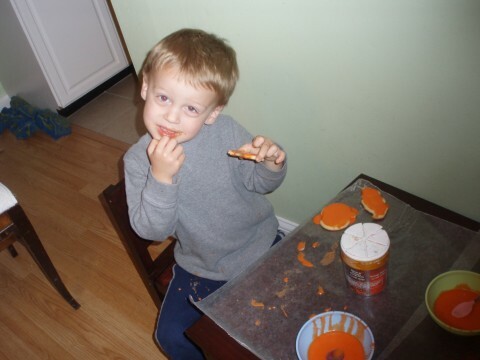 Step 5: Yum…time to lick the beaters. 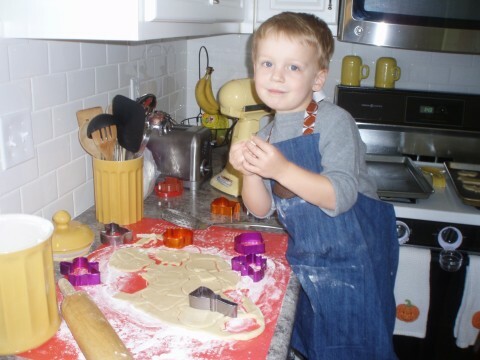 Step 6: The fun begins…it’s time to cut out shapes with the cookie cutters. Step 7: The cookies are out of the oven! Time to let them cool. Step 8: Taste testing is a must. You always have to make sure the food isn’t gross! Step 10: The eating part. See what I mean? Icing has been smeared on and there’s a significant lack of sprinkles, but there’s a whole lot of cookie eating going on! Our little artist thoroughly enjoyed her first scribble date with Mommy. Her finished product…with a few rips and tears. She discovered the paper was taped to the table and tearing it became way more interesting than coloring. 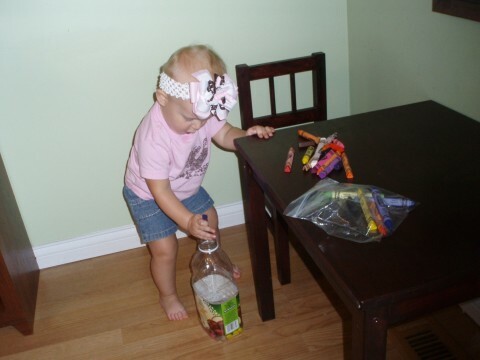 And then the empty apple juice container was just so much fun to put the crayons into. 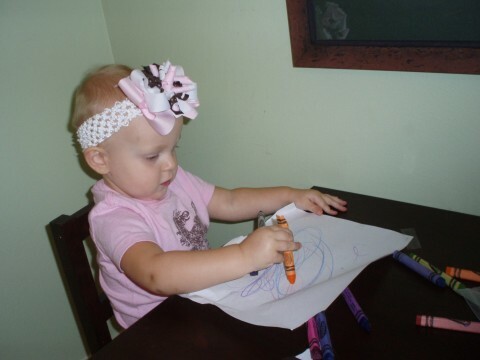 This kept her attention way longer than the coloring. 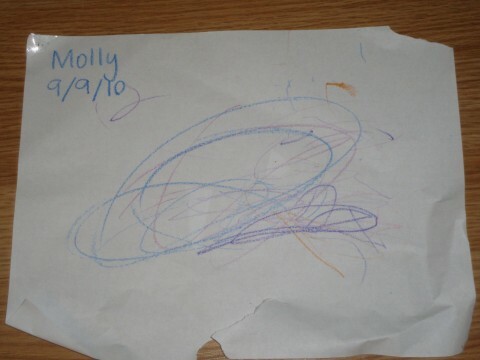 This little video of Molly’s scribbles gives you a glimpse of her personality. And you can see a bit of how she “talks”. When we ask her a question, she always answers with a long, drawn out, “uhhhhhhhh” and then a made up Molly word. She’s a character, our Molly.